As part of the efforts funded by the US Department of States’ “Breath of Fresh Air” Grant, Warm Heart held two days of training for women of the Mae Pang sub-district. Over the course of two days, roughly 45 women were trained in how to use the TLUD (top lift up draft) model to make biochar, how to make fertilizer from lemon grass and manure, and how to make fertilizer from molasses. These training sessions are part of a larger effort to help reduce smoke from the burning season, and consequently reduce the risk of serious health issues. Exposure to environmental air pollution from agricultural burning is a leading cause of respiratory disease in Northern Thailand. Women and children are more susceptible to respiratory issues due to the smoke produced by indoor cooking. In many households, women are also the ones to clean the yards by sweeping up and burning leaves. According to the World Health Organization, “Women exposed to heavy indoor smoke are three times as likely to suffer from chronic obstructive pulmonary disease (e.g. chronic bronchitis), than women who use cleaner fuels.” This statistic rings true for many women in Northern Thailand. Warm Heart’s two days of training is just the beginning of efforts to help women fight the smoke issues. 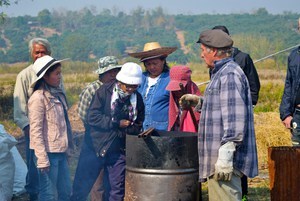 The Biochar Project aims to reduce seasonal air borne particulate pollution in Northern Thailand, reduce health risks for women and infants, increase the use of biochar-based organic fertilizer, decrease use of synthetic fertilizers, and increase farmer net incomes. Each of these goals contributes to a healthier and safer community.